The most depressing data about America’s economy is not the top tax rate, the regulatory burden, or the level of wasteful of government spending. Those numbers certainly are grim, but I think they’re not nearly as depressing as America’s demographic outlook. 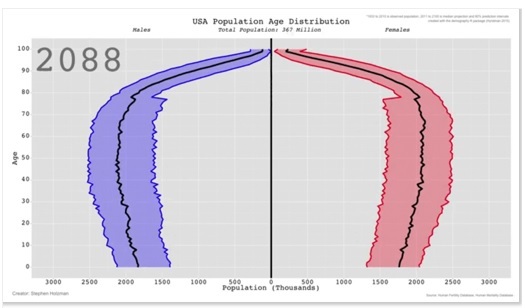 As you can see from this sobering image, America’s population pyramid is turning into a population cylinder. There’s nothing a priori wrong with an aging population and a falling birthrate, of course, but those factors create a poisonous outlook when mixed with poorly designed entitlement programs. The lesson is that a modest-sized welfare state is sustainable (even if not advisable) when a nation has a population pyramid. But even a small welfare state becomes a problem when a nation has a population cylinder. Simply stated, there aren’t enough people to pull the wagon and there are too many people riding in the wagon. But if America’s numbers are depressing, the data from Europe should lead to mass suicide. The Wall Street Journal has a new story on the utterly dismal fiscal and demographic data from the other side of the Atlantic Ocean. State-funded pensions are at the heart of Europe’s social-welfare model, insulating people from extreme poverty in old age. Most European countries have set aside almost nothing to pay these benefits, simply funding them each year out of tax revenue. 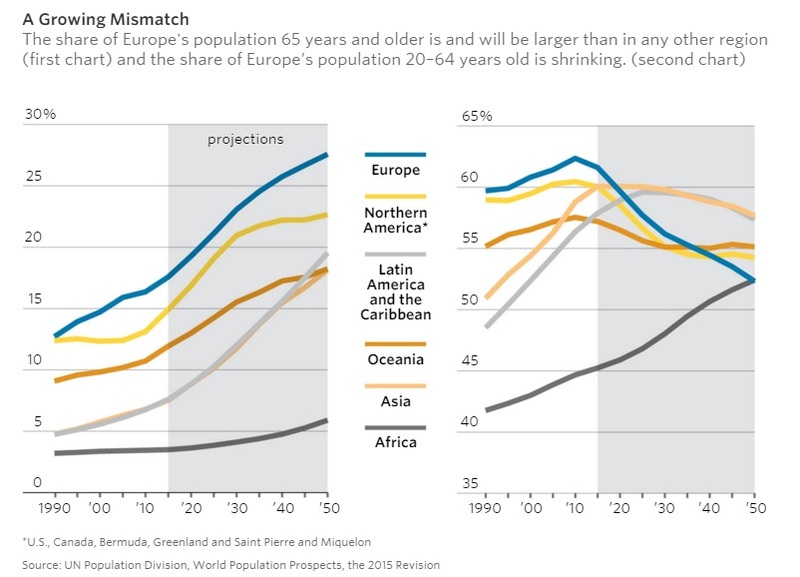 Now, European countries face a demographic tsunami, in the form of a growing mismatch between low birthrates and high longevity, for which few are prepared. …Looking at Europeans 65 or older who aren’t working, there are 42 for every 100 workers, and this will rise to 65 per 100 by 2060, the European Union’s data agency says. …Though its situation is unusually dire, Greece isn’t the only European government being forced to acknowledge it has made pension promises it can ill afford. …Across Europe, the birthrate has fallen 40% since the 1960s to around 1.5 children per woman, according to the United Nations. In that time, life expectancies have risen to roughly 80 from 69. 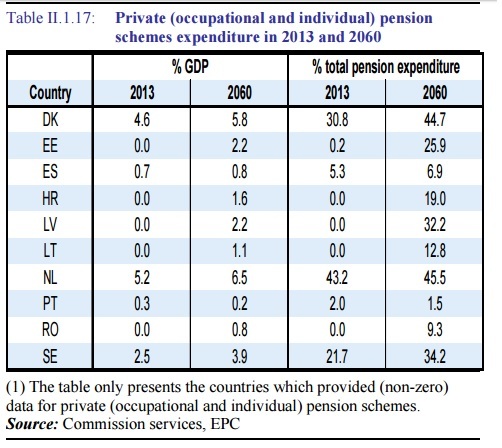 …Only a few countries estimate the total debt burden of the pension promises they have made. The various nations is Europe may not produce the data, but one of the few good aspects of international bureaucracies is that they generate such numbers. I’ve previously shared projections from the IMF, BIS, and OECD, all of which show the vast majority of developed nations will face serious fiscal crises in the absence of reforms to restrain the burden of government spending. New we can add some data from the European Commission, which has an Ageing Report that is filled with some horrifying demographic and fiscal information. First, here are the numbers showing that most parts of the world (and especially Europe) will have many more old people but a lot fewer working-age people. 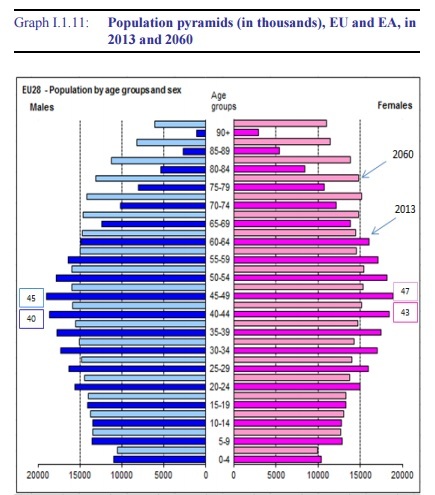 Looking specifically at the European Union, here’s what will happen to the population pyramid between 2013 and 2060. As you can see, the pyramid no longer exists today and will become an upside-down pyramid in the future. 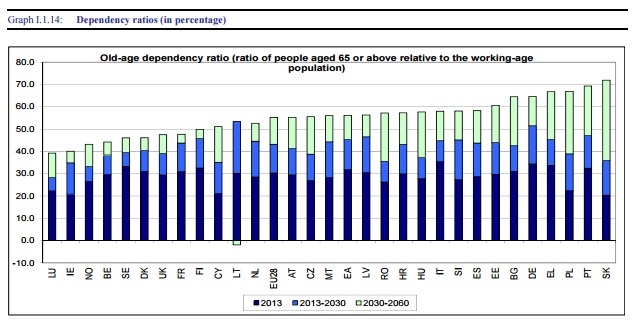 Now let’s look at data on the ratio between old people and working-age people in various EU nations. Dark blue shows the recent data, medium blue is the dependency ratio in 2030, and the light blue shows the dependency ration in 2060. The bottom line is that it won’t be long before any two working-age people in the EU will be expected to support themselves plus one old person. That necessarily implies a very onerous tax burden. But the numbers actually are even more depressing than what is shown in the above chart. 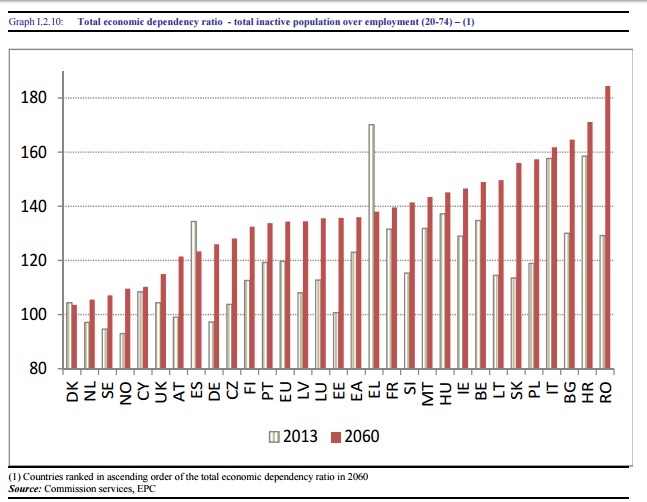 In the European Commission’s Ageing Report, there’s an estimate of the “economic dependency ratio,” which compares the number of workers with the number of people supported by those workers. The total economic dependency ratio is a more comprehensive indicator, which is calculated as the ratio between the total inactive population and employment (either 20-64 or 20-74). It gives a measure of the average number of individuals that each employed “supports”. And here are the jaw-dropping numbers. These numbers are basically a death knell for an economy. The tax burden necessary for this kind of society would be ruinous to an economy. A huge share of productive people in these nations would decide not to work or to migrate where they would have a chance to keep a decent share of their earnings. So now you understand why I wrote a column identifying safe havens that might remain stable while other nations are suffering Greek-style fiscal collapse. Having shared all this depressing data, allow me to close with some semi-optimistic data. I recently wrote that Hong Kong’s demographic outlook is far worse than what you find in Europe, but I explained that this won’t cause a crisis because Hong Kong wisely has chosen not to adopt a welfare state. People basically save for their own retirement. Well, a handful of European nations have taken some steps to restrain spending. 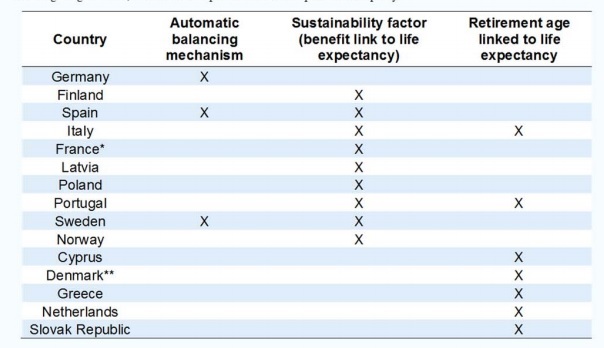 Here’s a table from the EC report on countries which have rules designed to adjust outlays as the population gets older. These reforms are better than nothing, but the far better approach is a shift to a system of private retirement savings. As you can see from this chart, Denmark, Sweden, and the Netherlands already have a large degree of mandatory private retirement savings, and a handful of other countries have recently adopted private Social Security systems that will help the long-run outlook. I’ve already written about the sensible “pre-funded” system in The Netherlands, and there are many other nations (ranging from Australia to Chile to the Faroe Islands) that have implemented this type of reform. Given all the other types of government spending across the Atlantic, Social Security reform surely won’t be a sufficient condition to save Europe, but it surely is a necessary condition. Here’s my video explaining why such reform is a good idea, both in America and every other place in the world. on October 27, 2016 at 12:37 pm Socijalistička demografska apokalipsa | Tko je John Galt? Dan. Great article! Have you seen DAVE walkers article in gov exec magazine on govt financial reporting – he recommends reporting intergenarional burdens etc. overcdue.